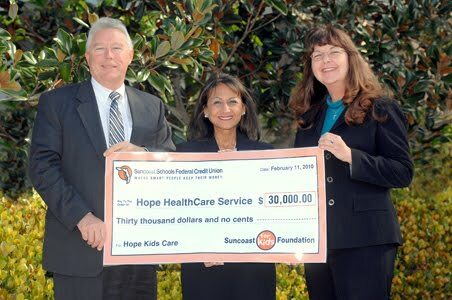 The National Ethnic Coalition of Organizations Foundation has named Samira K. Beckwith, President and CEO of Hope HealthCare Services, as a recipient of the 2010 Ellis Island Medal of Honor. The medal is presented to distinguished Americans who “represent the very essence of the American way of life, having greatly contributed to our national identity while preserving the distinct values and heritage of their ancestors,” according to the Foundation. As a young child, Samira Kanaan immigrated with her family to the United States from Lebanon, seeking the American Dream. 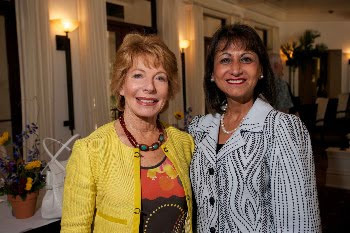 From her professional beginnings as a social worker, she has become a prominent leader in health care on the local, state and national levels. The Ellis Island Medal of Honor ranks among the nation’s most prestigious awards. 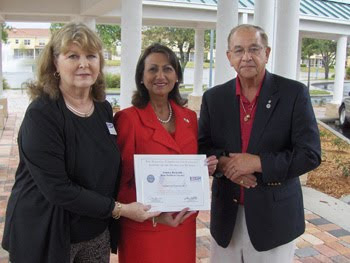 The US Senate and House of Representatives have officially recognized the honor, and each year the recipients are listed in the Congressional Record. Previous Medal of Honor recipients include: Jacqueline Kennedy Onassis; Rosa Parks; John Glenn; Muhammad Ali; Lee Iacocca; Donald Trump; Frank Sinatra; Barbara Walters; and six former US Presidents. Beckwith was nominated by Fred Pezeshkan, a previous medal recipient. 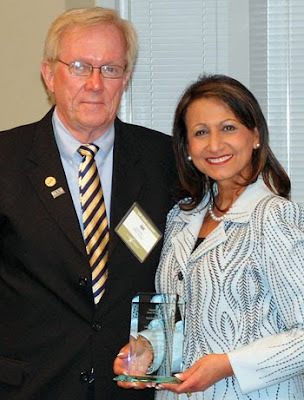 Pezeshkan is CEO of Kraft Construction Company and a member of Hope’s Board of Directors. The medal was presented during a ceremony on Ellis Island in New York, the historic gateway for millions of people from around the world who sought to become Americans. 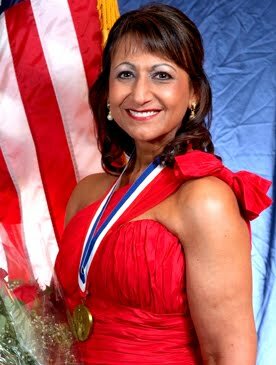 The Ellis Island Medal of Honor was established in 1986 by the National Ethnic Coalition of Organizations Foundation, Inc. (NECO). The creation of NECO was based on the conviction of its founders that the diversity of the American people is what makes this nation great. Its mission is to honor and preserve this diversity and to foster tolerance, respect and understanding among religious and ethnic groups. In a time of serious illness, health care decisions must be made carefully and thoughtfully. Our experience at Hope has shown us that these decisions are extremely difficult in a moment of crisis, whether they are being made by the person in life’s final chapter or by their loved ones. It is heartbreaking to see family members struggle to make choices when their loved one can no longer respond. “What should we do now?” is a question asked in despair that we have heard many times. Questions such as this are best discussed well ahead of the time of need, making difficult choices easier. One useful document that Hope makes available for advance care planning is Five Wishes, which Hope makes available to patients and their families. It is a living will that addresses the patient’s personal, emotional and spiritual needs as well as their medical wishes. Using the simple forms, the patient can name a health care surrogate and make choices regarding life support. Anyone could be affected by a life-changing illness at any time. Whether you are 21 or 91, these documents can help to insure that your health care choices and decisions are honored if you become unable to speak for yourself. Health benefits such as these bring peace of mind to the patients’ loved ones. For that reason, the most often-heard comment from families in our care is, “We wish we had known about hospice earlier.” By having these conversations, everyone can become more aware of the care that will be available at the moment it is actually needed. Decision-making will be easier. 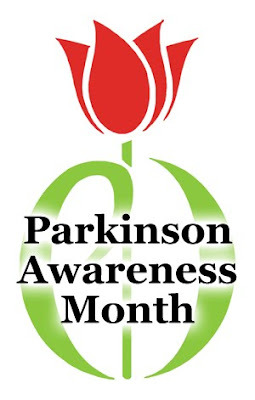 Discussion about preparing for future health care needs and wishes with patients who have a life-changing illness provides a gift of time and peace of mind by allowing for resolution. It gives the patient time to make choices regarding care while still able to communicate. The ongoing debate over healthcare reform has made it quite clear that America’s families need accurate reliable information about advance care planning in order to make informed choices before the time of need. Now more than ever, people need information about preparing for their future health care needs and wishes. April 16, National Healthcare Decisions Day, is a time to raise public awareness and inform others about the necessity of advance care planning. The effort is supported by Hope and other healthcare organizations, along with the American Medical Association and the American Bar Association. An essential part of Hope’s outreach efforts is to clearly explain advance care planning and to stress the value it to the patient and family members. 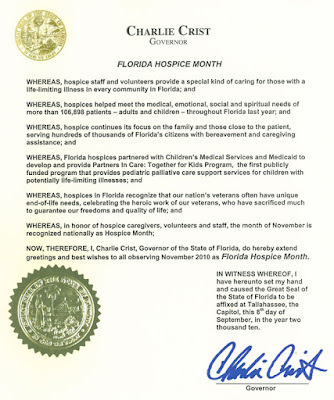 Honoring each persons wishes and choices have always been integral to the Hope philosophy of care. At Hope, we will continue to provide accurate information to help everyone understand the value and importance of advance care planning. It can make a significant difference. Questions such as this are best discussed well ahead of the time of need, making difficult choices easier. One useful document that Hope makes available for advance care planning is “Five Wishes,” which Hope makes available to patients and their families. It is a living will that addresses the patient’s personal, emotional and spiritual needs as well as their medical wishes. Using the simple forms, the patient can name a health care surrogate and make choices regarding life support. 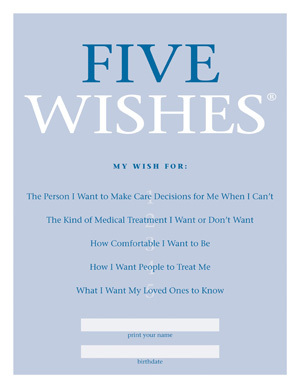 Please call us at (800) 835-1673 or fill out a form for a free copy of Five Wishes. The Committee is a Department of Defense organization that works to develop and promote a culture in which all American employers support and value the military service of their employees. Currently a Hope Chaplain, Jonathan Scalone, is deployed as a Lieutenant Colonel in the Air Force Reserve at Holloman Air Force Base in New Mexico. Photo caption: Marianna Grimes of the National Committee for Employer Support of the Guard and Reserve (left) and retired Navy SEAL John Klass present Certificate of Recognition to Samira K. Beckwith, President and CEO, Hope HealthCare Services. Award-winning chocolatier Norman Love, founder of Norman Love Confections, and Samira K. Beckwith, President and CEO of Hope HealthCare Services, announced a new partnership that designates five percent of Hope-related sales at Norman Love Confections to the health care organization for one year. 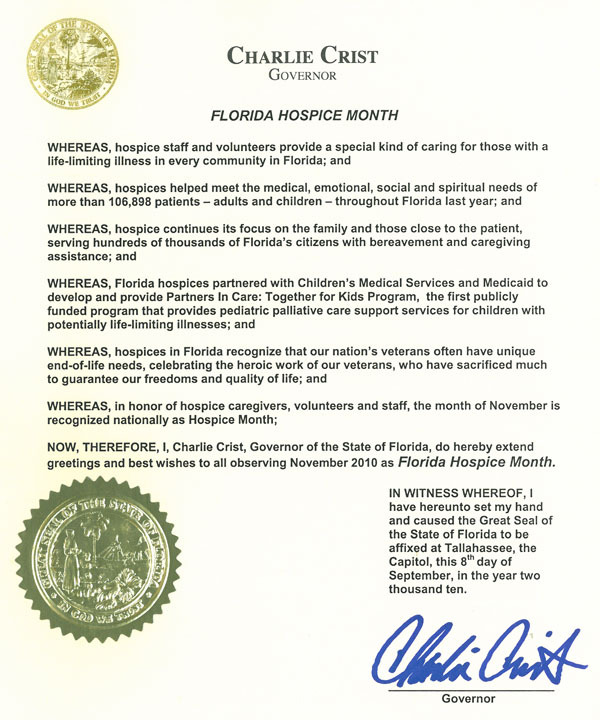 For more information or to make a contributing purchase, please visit hopehcs.org/love or hope.normanlove.com, or call (239) 985-7795. Founded in 2001 by Norman and Mary Love, Norman Love Confections creates and distributes ultra-premium, handcrafted artisanal chocolates. 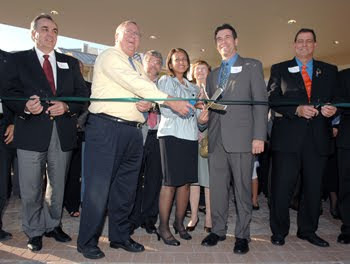 Based in Fort Myers, Fla., the corporate headquarters encompasses both the production and retail operations. The Chocolate Salon is a stylish retail shop with an intimate ambiance in which customers may purchase chocolates or linger over house-made pastries, gourmet coffees, lattes and smoothies. For more information about Norman Love Confections, visit the Chocolate Salon located at 11380 Lindbergh Boulevard, off Daniels Parkway, in Fort Myers, call toll free 866-515-2121 or visit hope.normanlove.com.